Penang is a hot spot in Malaysia. There are plenty of excellent reviews and recommendations about this lovely city. 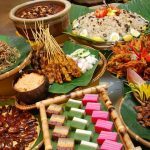 If you are new to this place, then this list of best things to do and eat in Penang will be a good start. There are many beautiful destinations with loads of temples, museums, and parks. You will never get bored in the city, even if you are traveling alone or going with your family. And when you are hungry, Penang will become a food paradise for you with delicious street food from many different cultures. There are many historical and ancient buildings in Penang, from restaurants to hotels. Some houses are still less than 20 years old, but they still offer you a unique feeling. In order to refurbish and restore those legacy sites, travelers are permitted to stay overnight in these ancient buildings, just like regular hostels or hotels. A famous and exciting place for you to visit is Blue Mansion – this one even has a museum inside its area or the Seven Terraces with a unique Peranakan-themed. Therefore, spending one night there will be entirely different than other hotels. This dish is one of the most famous desserts in Penang, which is light, cool, and chewy. A bowl of Teochew Chendul is full of ice, red beans, the spot-on chewy green jelly (Chendul), coconut milk and a spoon of brown sugar. This cool down dessert would be perfect for a hot day in Penang. You can easily find some vendors on the street selling this dessert. There is a vendor next to famous Joo Hoi Coffee shop. Otherwise, just pick any vendor with people gather in line or around. Take your own pictures of famous artworks on streets at George Town. 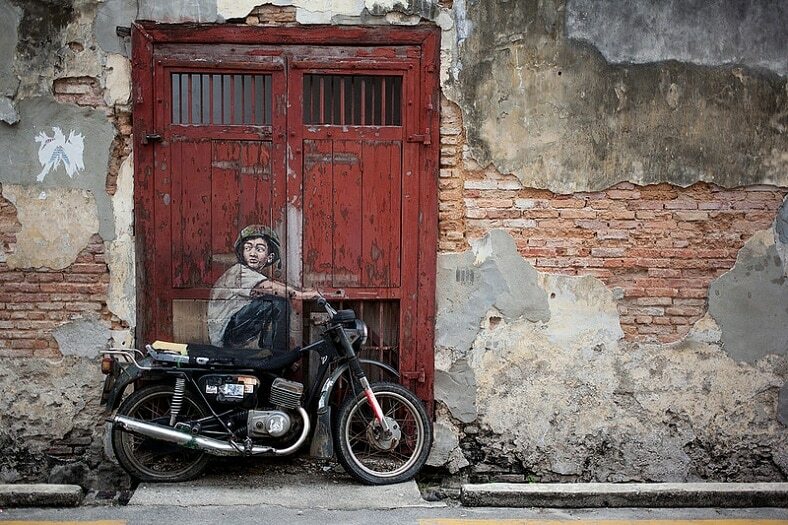 Street arts now become a signature of Penang. You can look for them on any social network, especially on Instagram or Facebook. These artworks are nearly covering all of the places on the streets, and you will find them all creative and excellent works. Some pieces are so famous that every single traveler to Penang would like to have pictures with them. Since it quickly becomes a trend, many hotels offer the rental bike to go around and hunt all of them. This activity is legit and worth spending a whole day looking for these masterpieces. 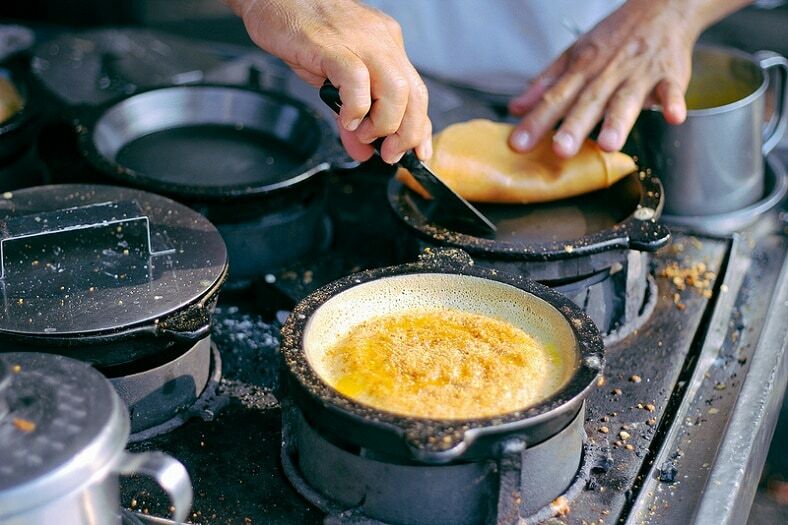 This local pancake is thin with the center’s flavor can be customized with eggs, bananas, brown sugar or shaved coconut. It’s easy to find your own favorite flavor or combination among those elements would be fine. You can buy this pancake on the street from both Indian and Chinese vendors. Each pancake is made in a particular pan by a traditional way with the charcoal fire for more flavors. So, it will be a great snack to fill energy onyour trip. The Kek Lok Si Temple is a popular site and is considered as one of the biggest temple compounds in the city. You will find that this temple is an important piece of Chinese worship and Buddhism in Penang. It has many carvings and sculptures and a huge amount of Buddha’s images around. Especially at night during Lunar New Year or Wesak Day festivities, the whole place will be lighted up with many lights and candles. 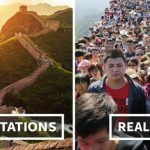 Of course, it will be very crowded with many worshippers, but it is ok for you to blend in. This way will let you see a different angle of this temple than normal. This dish is well known for its spicy and delicious flavor and becomes a fine unique dish of Penang. 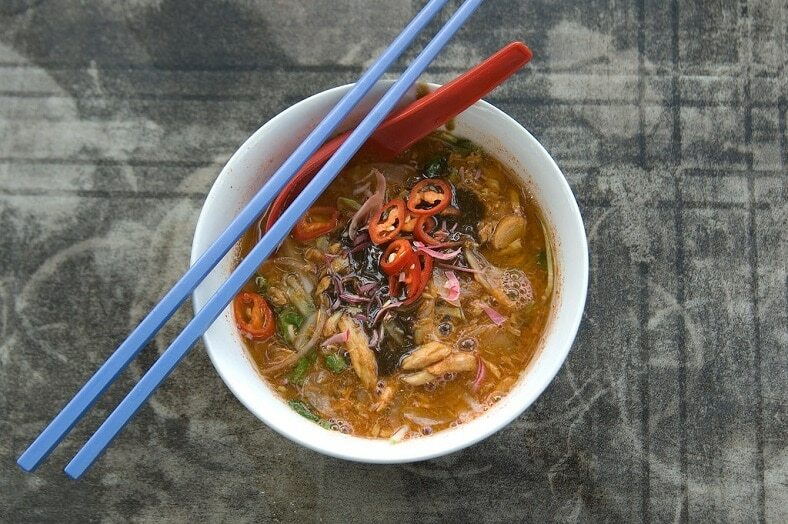 For details, Assam Laksa has fish-based broth with lots of tamarind juice, lemongrass, chili paste, sardine flakes, and a bit prawn paste as well. Unlike Pho in Vietnam, the noodle Offers many choices for customers, from yellow to white or thin to thick. This dish has a strong flavor of tamarind and spicy but worth trying. In fact, it could be the main dish by the end of a whole day exploring Penang. There are still plenty of things to do and eat in Penang but this list of suggestion would be a balance for your brain and your stomach. A full day of exploring exciting places will feed your stomach with incredible foods. What could be better than this? Let’s go ahead and kick your feet to Penang now.